Two Banana Split Festival-goers discuss classic cars Friday afternoon. Friday’s Banana Split Festival docket included a classic car cruise-in. 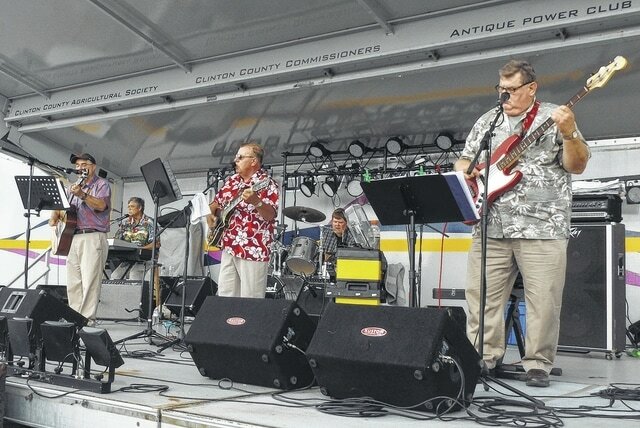 Local band Rewind rocks out on stage at the Banana Split Festival Friday. Front, from left, Danny Mongold, Bill Jenkins and Joe Spicer; back, from left, Paul Shivers and Bill Spicer. Attendees braved humidity and dodged showers and storms to kick off the 21st Banana Split Festival late Friday afternoon at J.W. Denver Williams Jr. Memorial Park in Wilmington. Friday’s scheduled festivities included a cruise-in plus entertainment by Rewind, Par 5 and the Brent Keith Band. The festival, organized by Wilmington’s Rotary clubs, continues Saturday from 10 a.m. to 10 p.m. The day’s events include the Classic Car Show in the morning and the Banana Split Eating Contest at 4 p.m.
Musical entertainment for Saturday includes: 11 a.m., Heavy Medicine; 12:30 p.m., The Folks; 1:30 p.m., Sawgrass; 2:45 p.m., Praise & Worship, Robin McMillian, Ben Schaad and Katie Smith; 3:30 p.m., Third Generation; 4:30 p.m., The Folks return; 5:30 p.m., Cheap Thrill; and 7:30-8:15 p.m. and 8:30-10 p.m., Blue Steel. For more information on the Banana Split Festival, go to www.bananasplitfestival.com.